An arc flash study is the analysis of a power system’s components and how each device interacts with other equipment. Each piece of electrical equipment has a nameplate that gives specific information on it. Performing an arc flash study takes the information from similar device nameplates and plugs that data into a software program that calculates the incident energy for each piece of equipment and what Personal Protection Equipment (PPE) should be worn. This is paramount to safety. Arc Flashes can reach temperatures hotter than the sun (9,000 degrees Fahrenheit), which can melt equipment and severely burn people. According to the NFPRF, there were 99 fatal injuries due to arc flashes in the installation, maintenance and repair industry from 2004 to 2010. Every year, that number declines due to safety practices. Without Arc Flash Labels your workers, are at best, guessing how to work safe around your energized electrical equipment. Last time we checked the OSHA standards; they aren’t a big fan of guess work. Arc Flash Studies should be performed every time there is a major change to your system or at least every 5 years. In order to perform an arc flash study, a short circuit study and a coordination study must be performed or previous information from these studies must be available. CE Power is capable of all three, using highly skilled and accredited engineers who get the job done safely and efficiently the first time. CE Power has the engineers and equipment to properly perform an arc flash study. Changes have been made to NFPA 70E for the 2015 year and CE Power can help your facility comply. Campbell, Richard B., ScD., and David A. Dini, P.E. Occupational Injuries From Electrical Shock and Arc Flash Events. Rep. Fire Protection Research Foundation, Mar. 2015. Web. 27 Oct. 2015, Page 23, Figure 11. Pridlides, James A., Ed Safdie, and Wally Thompson. 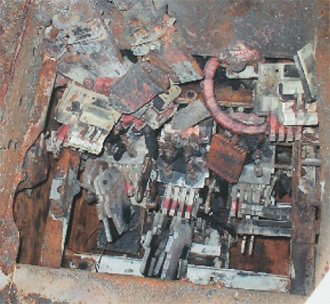 Melted Switchgear. Digital image. Electrical Construction & Maintenance. N.p., 1 Sept. 2002. Web. 5 Nov. 2015.